If you’re a current student who’s enjoy classes, it would mean a lot to us if you left us a positive review on Google! or Facebook! Ali: I had been craving to take silk classes after I first saw Rascal Flatt’s ‘Skin’ music video. When I saw that there was a studio in New Haven I was THRILLED. 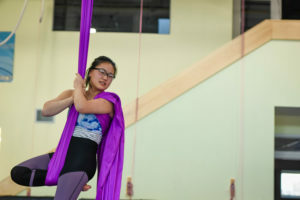 I was more than excited to take lessons at Air Temple Arts. And just graduating college- I was very happy with the prices. Very affordable. Stacey is a unique and rare teacher- one you don’t meet often but you wish you did. She teaches to each student’s strengths and weaknesses. The studios atmosphere/ learning environment is remarkable. It is a place to get away from the world and just practice and learn with the support and encouragement of Stacey and classmates. Every week we practice and learn new skills. Every week I look forward to going and I countdown the days until it is Wednesday again! Stacey has shows every few months. You will want to attend these shows!! Students are either giving their first performance ever or showing the audience new skills they have learned. It is an inspiring event. Personally, it made me want to push myself so I can participate in the next show. It made me want to work and train harder and push myself outside of class so I can excel more in class. It also opened my eyes to different types circus arts I would love to try! Stacey opened my world to a new experience. 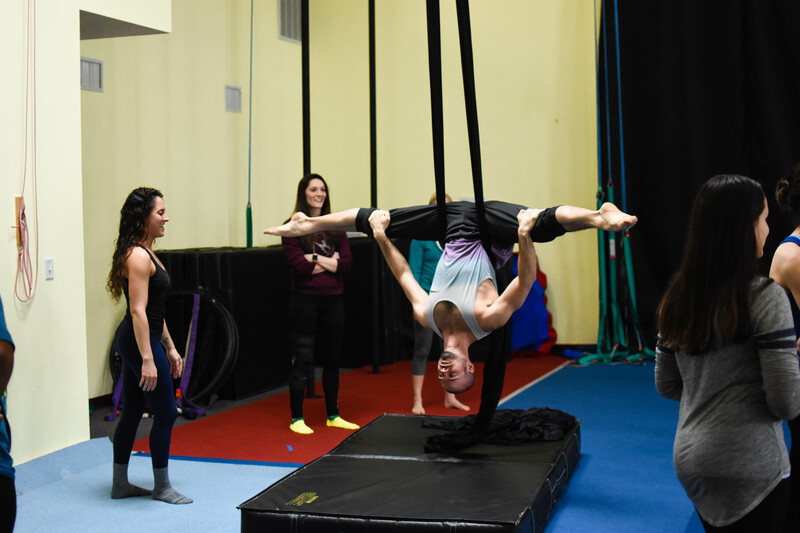 Taking these aerial classes are making me stronger in body and mind. I can see myself getting stronger. I can also see myself gaining the confidence I’ve always wanted. Thank you, Stacey for opening up this studio, and changing lives (even if you don’t know you are). You are the BEST. – Via Yelp. 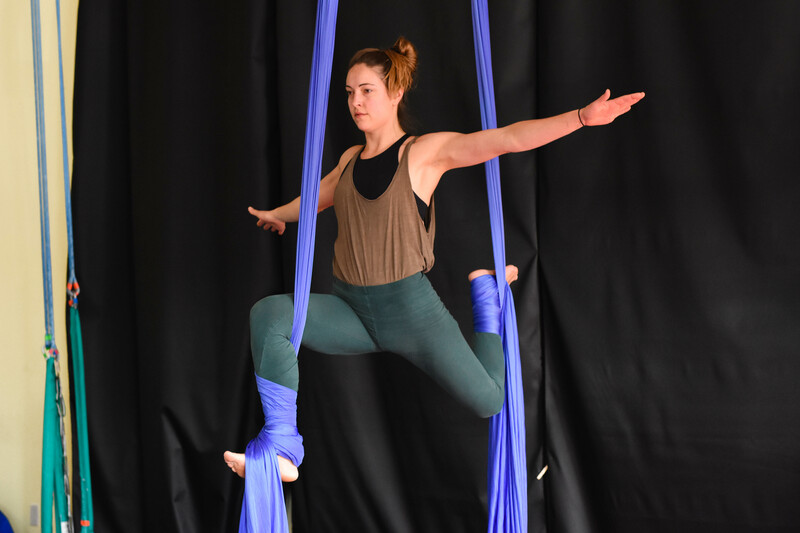 Katie: Stacey creates an excellent atmosphere with her students, breaking down her lessons so you can easily follow and you feel quite successful after each class. She knows her skills and knows how to teach. I can’t recommend her enough! I had so much fun in her class my husband joined too! Andy: I’ve had a blast taking Stacey’s class. She is easy to get along with, knowledgeable, patient, and very enthusiastic with her teaching. She learns each student’s strengths and weaknesses and tailors her lesson to maximize your benefit. It’s a great program! Beracah: Having always wanted to run away away with the circus, I was thrilled to find an instructor locally that offered aerial silks classes. Though I had taken a couple of classes while living in NYC, it was a brand new experience for the other students in the class. With words of encouragement, attention to proper form and safety, Stacey makes the art of aerial performance fun and accessable. Starting with some simple foundations, both on the ground and in the air, Stacey has made it rewarding to see progress in my own strength and abilities as well as in my fellow classmates. While I have a bit of a fear of heights, most of the moves and tricks can be performed and worked on closer to the ground with lots of mats and padding for safety. Be prepared to sweat a bit! While this work out takes a bit of concentration and thinking, Stacey always takes the time to demonstrate and explain the process until you get it.